• A type 1 experiment uses differentially labeled control and experimental RNA populations and makes a direct comparison between the two on one array (RNA-RNA arrays). Type 1 experiments include those that aim to identify genes up- or downregulated under experimental conditions such as during a host infection compared to in vitro culture  (Fig. 2.1). 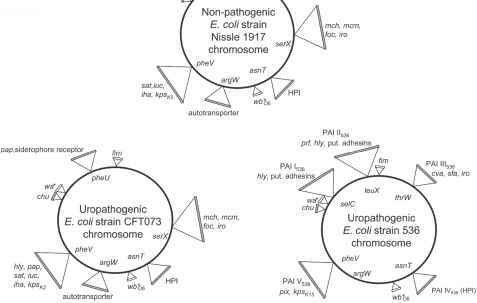 • A type 2 experiment makes indirect comparisons between two RNA samples. 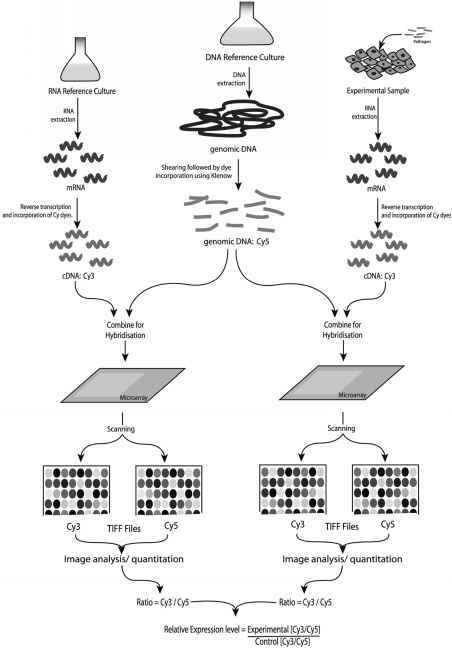 In this type of experiment each RNA sample (experimental and control) is hybridized to a separate array along with a reference gDNA sample (RNA-DNA arrays). Type 2 experiments include more recent array studies that analyze expression profiles, and more complex studies such as those that follow a population over a time course and those that make multiple comparisons to a reference sample  (Fig. 2.2). Note that genomic DNA (gDNA) should be extracted from a cell culture in the stationary phase, as partially replicated chromosomes will affect the gene copy number. Fig. 2.1 A type 1 (RNA-RNA) experiment makes direct comparisons between two RNA samples (an experimental and a control) on one array. The fold change in gene expression between experimental and control popula tions is calculated by dividing the fluorescence reading from the experimental population (Cy5, in this case) by the reading from the control (Cy3). This ratio is then transformed to its logarithm to the base 2.
populations are a ratio of ratios, calculated by: (1) dividing the florescence reading of each RNA sample by that of the gDNA standard, and then by (2) dividing the experimental by the control. This ratio is then transformed to its logarithm to the base 2. As with all biological experiments it is important to have a sufficient number of replicates to insure statistical validity and to remove the effect of any external, random influences. There are two types of replicates to consider when using microar-rays: biological and technical. Biological replicates are repetitions of the same experiment but performed with different RNA samples. Technical replicates are simply multiple arrays performed with the same RNA sample. Technical replicates can be performed at different levels - for example, labeling of the cDNA, duplicating spots on the array, and rescanning arrays. It has been suggested that microarray experiments should contain at least three biological replicates to increase reliability ; however, other groups have suggested that far more replicates are needed to increase the sensitivity of a microarray experiment so that genes with low-fold changes in expression are easily detected . It is also clear that biological replicates are more important than technical replicates, should there be limited resources. There is therefore a hierarchy of replicates (Fig. 2.3), with biological replicates at the top, and the method of analysis must reflect this (see below). Inherent variations (or systematic errors) occur within any microarray experiment, some of which can be minimized during the experimental procedure. The most common of these is the dye bias, which occurs because the size and shape of the Cy labels influences their rate of incorporation. Cy3 is much smaller and more easily incorporated into cDNA than Cy5. The effect of this is usually adjusted for during data normalization, although some groups prefer to carry out dye swap experiments when performing type 1 studies [26, 27]. In type 2 experiments (RNA-gDNA) the same dyes must be consistently used to label the DNA and RNA populations so that gDNA can act as a constant denominator. This allows raw data from any array produced in this way to be compared almost directly, and is reportedly more reproducible than an RNA-RNA array .